Streak is a free customer relationship software which integrates into Gmail where it allows users to manage each Gmail contact and each Gmail message as an element of a CRM – customer relationship management system. Let’s face it, a sales person spends majority of their time going through emails, if it’s online sales that we’re talking about, and with Streak, your Gmail account becomes your CRM software, simple as that. After you install the Streak extension from the main website you will gonna have to allow it access to your account, after which you will be presented with a window where you can choose what kind of pipelines you would like to create. 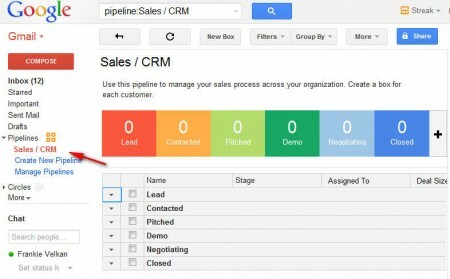 Some of the available pipeline types can be seen above, a pipeline is basically where you can sort different deals, if you are for example working on both CRM and Investments at the same time. Similar software: 4 Free CRM systems, myERP, Erply. You can see how useful boxes are, you can sort each one of your Gmail contacts and emails into their box, based on the status of the deal. For those customers who were just now proposed with a deal, they can be placed in the Pitched box, those who were given samples of the product that you’re selling they can go in the Demo box, and those clients to whom you’ve successfully made a sale, they can be placed in the Closed box. Emails of deals that you’re working on can be added to boxes by clicking on the desired email in your Inbox, then clicking on the boxes above and entering the name of the box where you want to add this particular contact/email. On the right you will get a list of pipeline boxes and you can simply store the message in the correct box. Later on as the correspondence continues between you and the client you can change the box to one of the other mentioned, or you can create your own box. 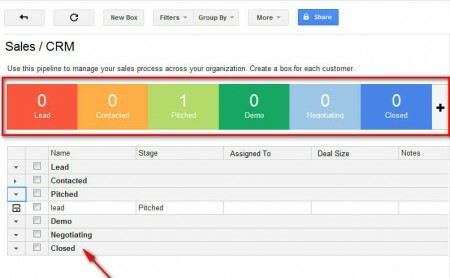 Notes can also be written for each customer that’s managed with the help of this Gmail customer management extension. If you spend a lot of time in your Gmail account, then Streak is just what you need, very easy to use, small size CRM which integrates into your email account, try it it’s free.